Is Lehi Hospital in Utah haunted? Lehi hospital first started as a bank in 1891, the second story serving as a ward house for a local congregation. In 1824, an auto body businessman conducted a crematorium in the basement. It is said bodies would be cut up into quarters to burn because the furnace was not large enough to fit an entire body in. In 1926 it became Lehi’s first hospital. It's believed that the head doctor hung the head nurse from the front flagpole, many people have died in the hospital, and at least one person has died in the elevator. 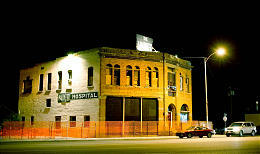 Many psychics and mediums have visited the building and often reported activity there. One Psychic said she thought there could be up to 50 spirits in the building. The main ghost sightings include the ghost of the head nurse who has been seen walking around the area of the flag pole where she was hung. A man in a white suit has also been reported quite often. He is thought to be friendly though and was described by one psychic as a man of intelligence and knowledge.